Passionate Amateurs tells a new story about modern theatre: the story of a romantic attachment to theatre's potential to produce surprising experiences of human community. It begins with one of the first great plays of modern European theatre - Chekhov's Uncle Vanya in Moscow - and then crosses the 20th and 21st centuries to look at how its story plays out in Weimar Republic Berlin, in the Paris of the 1960s, and in a spectrum of contemporary performance in Europe and the United States. This is a work of historical materialist theatre scholarship, which combines a materialism grounded in a socialist tradition of cultural studies with some of the insights developed in recent years by theorists of affect, and addresses some fundamental questions about the social function and political potential of theatre within modern capitalism. Passionate Amateurs argues that theatre in modern capitalism can help us think afresh about notions of work, time, and freedom. Its title concept is a theoretical and historical figure, someone whose work in theatre is undertaken within capitalism, but motivated by a love that desires something different. In addition to its theoretical originality, it offers a significant new reading of a major Chekhov play, the most sustained scholarly engagement to date with Benjamin's "Program for a Proletarian Children's Theatre," the first major consideration of Godard's La chinoise as a "theatrical" work, and the first chapter-length discussion of the work of The Nature Theatre of Oklahoma, an American company rapidly gaining a profile in the European theatre scene. 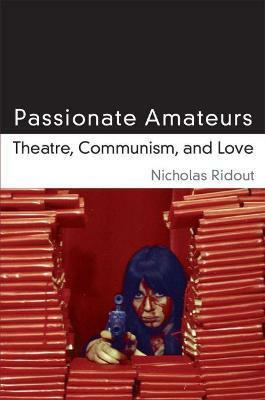 Passionate Amateurs contributes to the development of theatre and performance studies in a way that moves beyond debates over the differences between theatre and performance in order to tell a powerful, historically grounded story about what theatre and performance are for in the modern world. Nicholas Ridout is Reader in Theatre and Performance Studies, Department of Drama, Queen Mary, University of London, UK.